Dubai is an international city due to presence of large number of expat population. People from Middle East, Asia Pacific, South Asia, Europe and other parts of the world are residing in Dubai due to the business and job opportunities provided by the authorities of Dubai. People from all around the world are taking advantage of the opportunities available to them in Dubai and it is evident from the fact that students from 187 nationalities were enrolled in private schools in the academic year 2016-17. Currently, there are around 185 private schools in Dubai and around 274,000 foreign students enrolled in these private schools in the recent academic year. These schools are providing education in the American, British, Pakistani, Indian, Japanese, Canadian, German, Russian and other curriculums. These statistics clearly reveal the opportunities of private school setup opportunities in UAE. According to the standard of education and curriculums, these private schools charge from AED 1,725 to 107,200 per year. 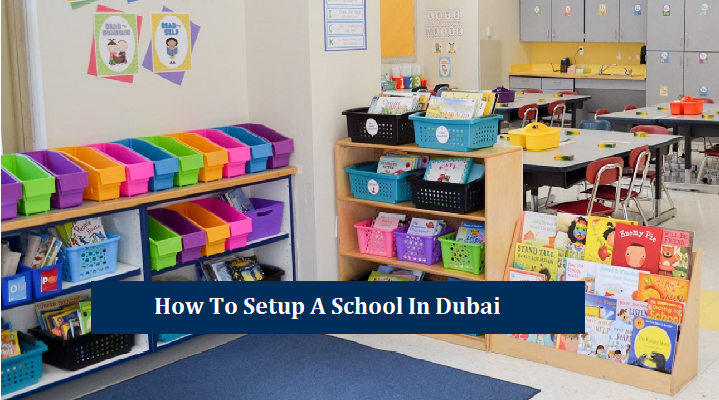 The private school department in Dubai is organized by Knowledge & Human Development Authority (KHDA) that operates in the free zones inside Dubai, and the Ministry of Social Affairs, that is the authority in Dubai Main Land. The fee of these private schools is also administered by the authority and private schools with high standard are allowed to increase their school fees. Most of the foreign students in Dubai obtain education from private schools. With the increase in expat population in Dubai, the chances of setting up private schools in Dubai are also increasing. Interested entrepreneurs can start school in various curriculums that are listed above as people from various nationalities and cultures are residing in Dubai and prospects of growth of schools in all these curriculums can easily progress if the school gets highly ranked by KHDA. It will not only allow the school administration to increase their fees but also more and more people would like to enroll their children in the school to provide better education to their children. The opportunities for setting up a school are available not only in mainland Dubai but also in various free zones present in the Emirati state. One such example is the Dubai International Academic City. This free zone is specific for education sector where education institutes from schools to universities can easily be established. The proposal for setting up a school in Dubai includes three main parts: complete school application form, academic plan and site plan. This proposal must contain the name, profile and contact details of the applicant in the first place. In the second stage, the name and address of the proposed school will be mentioned. This section include other details about school like the number of classrooms, offices, science laboratories, rooms for staff, facilities for sports, grounds and play areas and number of washrooms for students and staff. In the subject of number and gender of students, the applicant has to mention the grades and classes that will be established in the 1st year of school and in the coming years. These classes must be mentioned along with the designation of classes for single or both genders. Target number of students for various classes must also be mentioned in this section. The school management also has to describe the number of hours per day and the number of days per year that the school will provide education to the students. The application must also include the curriculum in which the education will be provided and this should be mentioned with detail that includes the range of subjects to be offered. The instruction language also has to be mention. There is a possibility that the school may have more than one language of instructions. Admission policy and school management must also be mentioned in the first stage. These are main points that you will mention in your application. After evaluating your application, the KHDA or MSA will decide about approval or rejection of the application. The authority considers the quality of teaching, curriculum according to students’ requirement, school’s support for students and other factors before making any decision. The schools are divided among four categories according to the academic plan. The proposed schools are given the status of outstanding, good, acceptable or unsatisfactory. A school is allowed to be established only after it is rated as ‘Good’ by the authority.